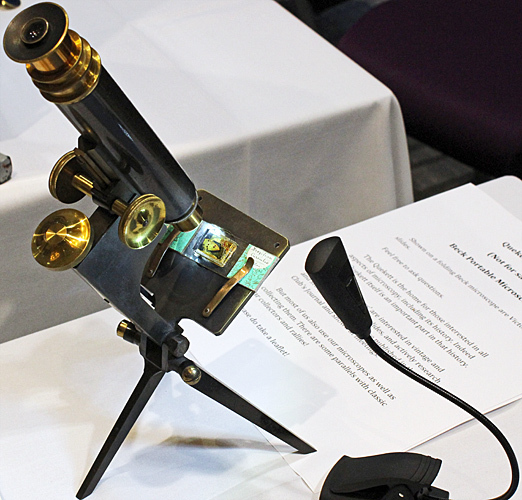 This was the 60th Antique Scientific Instrument Fair, and the fifth time that the Club has had a stand as part of our microscopy outreach programme. 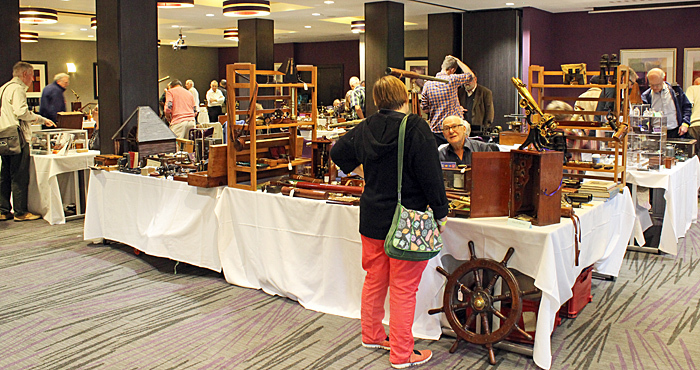 The Fair is organised by Don Edwards of the Tideswell Dale Rock Shop, who kindly offered the Club a free table at the event in the Doubletree by Hilton Hotel in London. 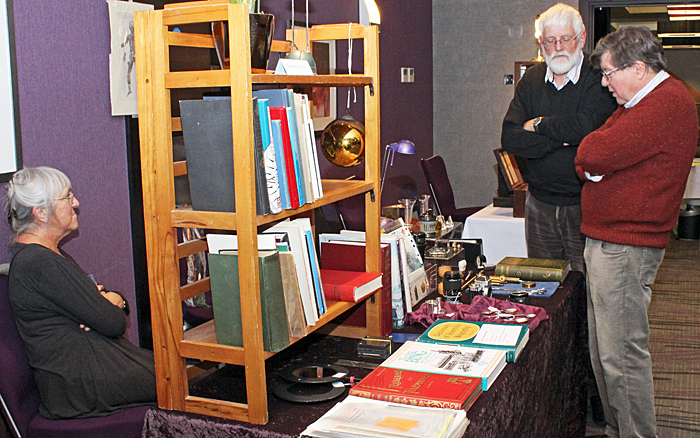 Our table was in the main sales area again, manned by Stephen Parker and Alan Wood. 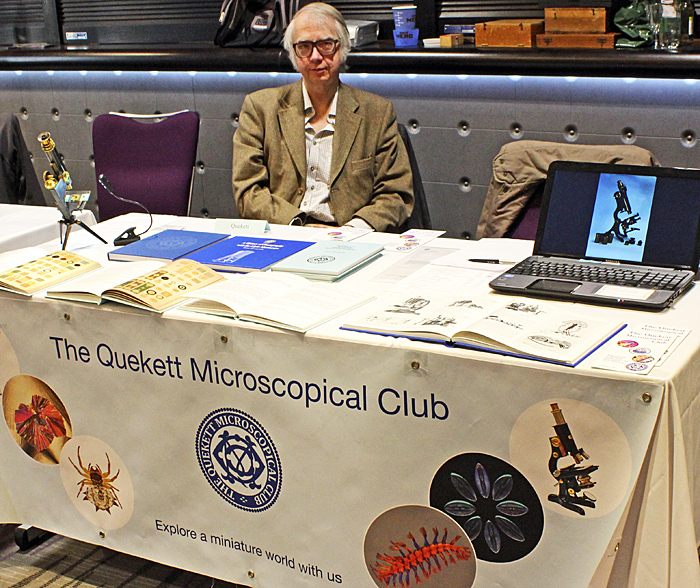 We showed copies of Brian Bracegirdle’s last book (The Quekett Microscopical Club 1865–2015) and 3 of his older titles (Microscopical Mounts and Mounters, Notes on Modern Microscope Manufacturers and A History of Photography with the Light Microscope). Alan brought one of the Club’s laptops with a slide show of antique items from Club auctions and photographs from the archive. 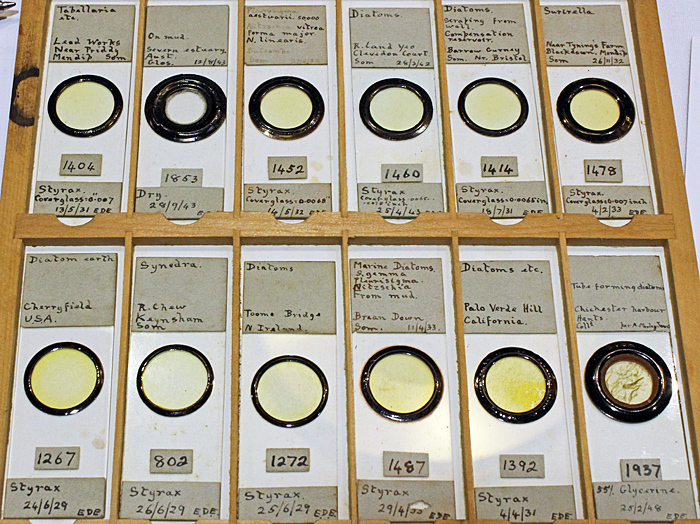 Stephen took a black and brass R. & J. Beck portable microscope with Victorian slides of mallow pollen and an elytron of a diamond beetle (Cyphus germari, the Brazilian curculio). 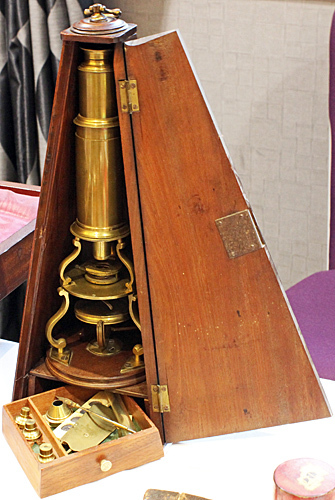 Visitors to our stand included some of the dealers, some visitors and some Quekett members. 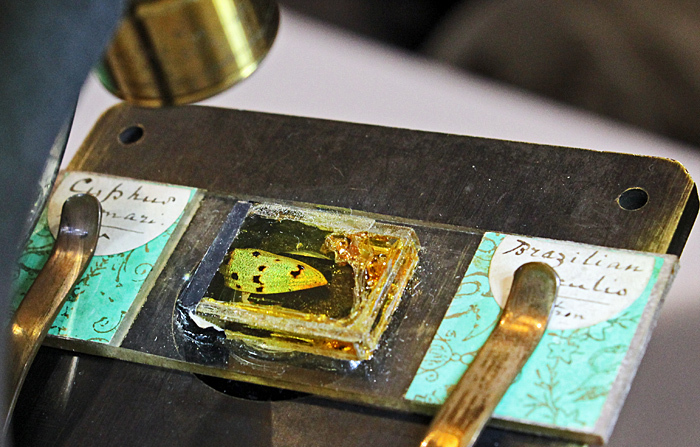 One lady asked how to get sufficient UV light for photography through her old Beck microscope; she was already using quartz condenser, slides, coverslips, objectives and eyepieces, and an EOS digital SLR with its UV filter removed, but exposures were around 3 minutes. 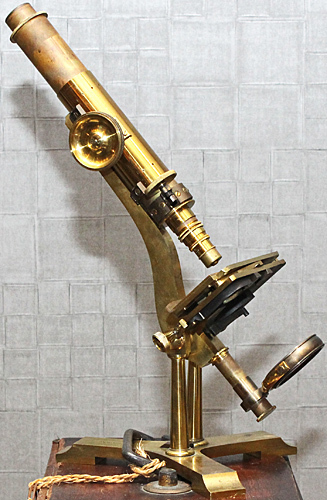 This turned out to be a new member, Penny Thoyts, who enjoys restoring old microscopes, making replacement parts and mixing her own lacquer, as we could tell from the yellow turmeric stains on her fingers! 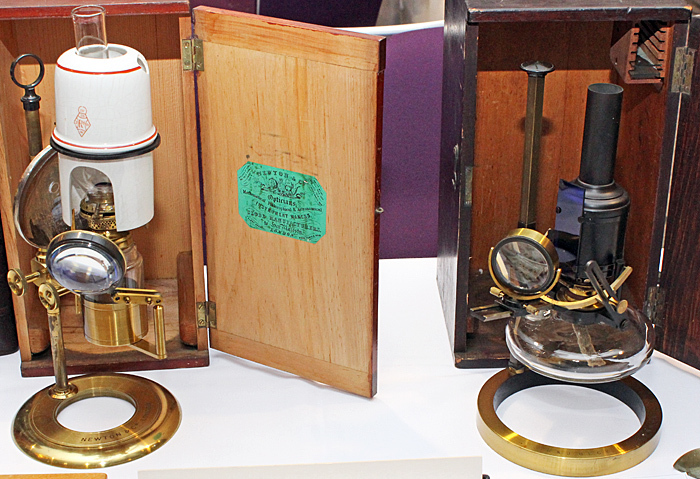 The dealers were from the United Kingdom, continental Europe and the USA, selling not only microscopes and slides, but also books, telescopes, binoculars, folding cameras, spectacles, firearms, surgical instruments, drawing instruments, laboratory equipment, telephones, globes, barometers, spectroscopes, sextants and Wimshurst machines. 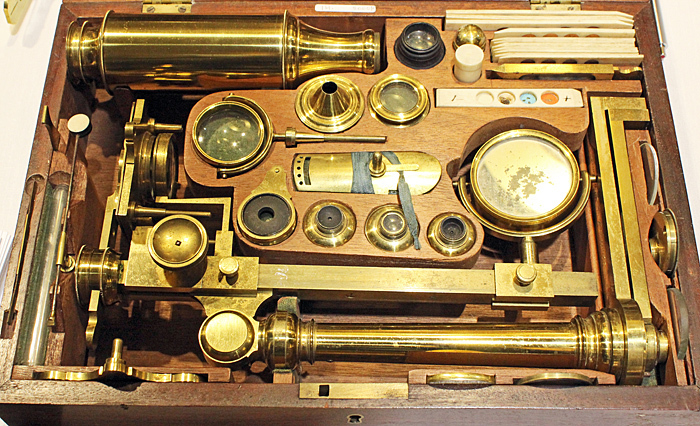 Quekett member Desmond Squire had a good assortment of books, Watson catalogues, Zeiss brochures and various other items. 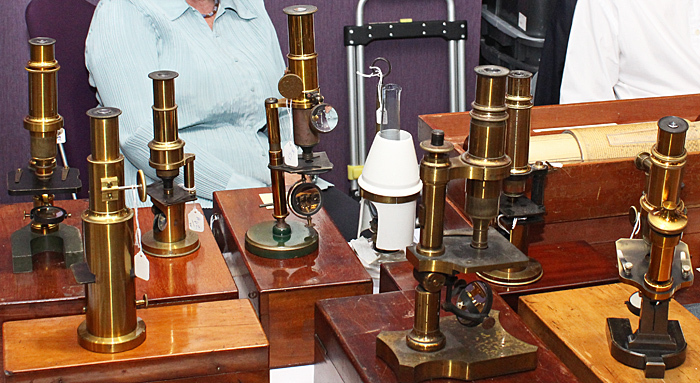 Microscopical items on offer included a Wenham binocular by Crouch, large and small brass microscopes that come apart for storage in flat boxes, a black and chrome Leitz polarising microscope, an England Finder slide, stage micrometers, oil lamps, NBS diatom test slides, standard and small papered slides, lots of thin sections of rocks, and some diatom slides by E. D. Evens.